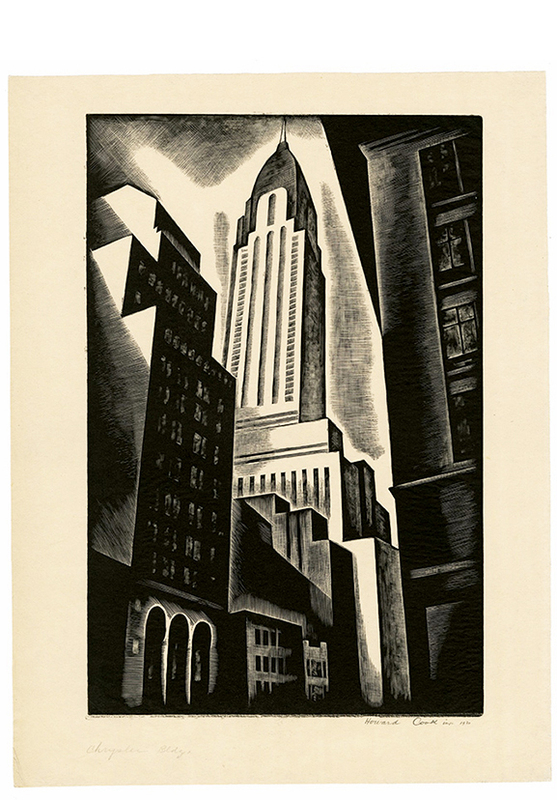 Chrysler Building (Chrysler Building in Construction) - -1930, Wood Engraving. Duffy 122. Edition 75, only 50 printed. Signed, dated and annotated imp in pencil. 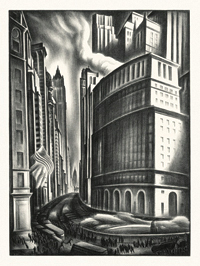 Titled Chrysler Bldg. in the bottom left margin. Image size 10 1/16 x 6 11/16 inches (256 x 170 mm); sheet size 11 7/8 x 9 inches (302 x 229 mm). A superb, black impression, on thin, cream wove Japan paper, with full margins (1 1/4 to 5/8 inches), in excellent condition. Printed by the artist. 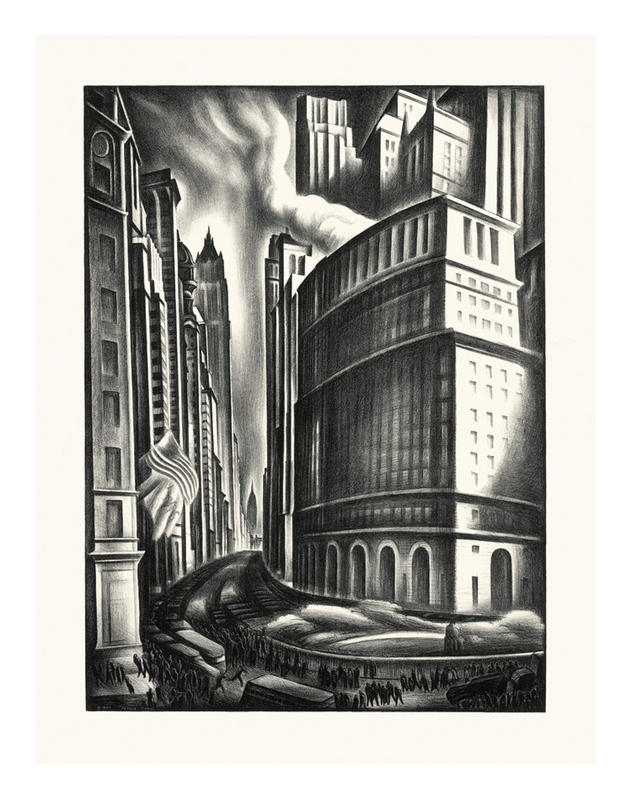 Chrysler Building is among the artist's most renowned precisionist works. 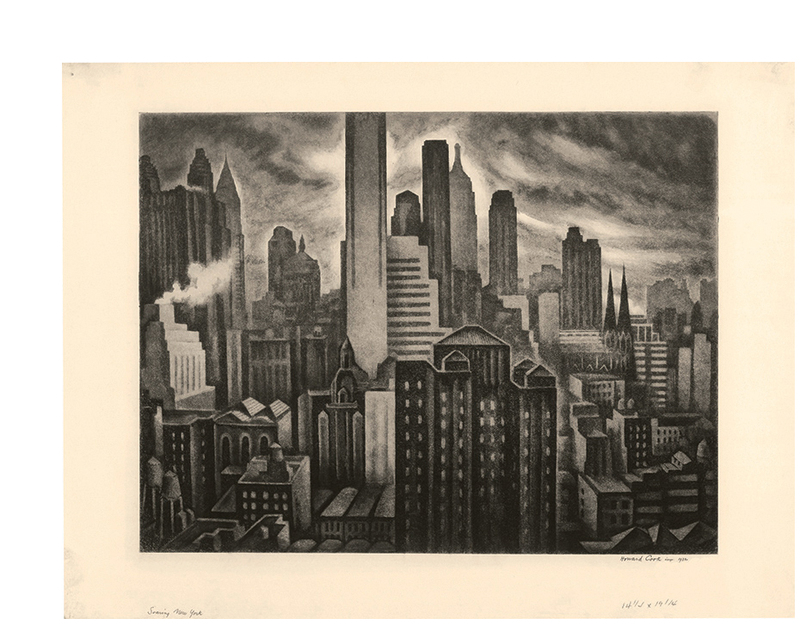 Cook's compelling composition emphasizes the monumental, sculptural presence of the Chrysler Building by framing it with the smaller surrounding buildings—the angular geometry and stark contrasts of light and dark convey the dynamism of the emerging New York City skyline. 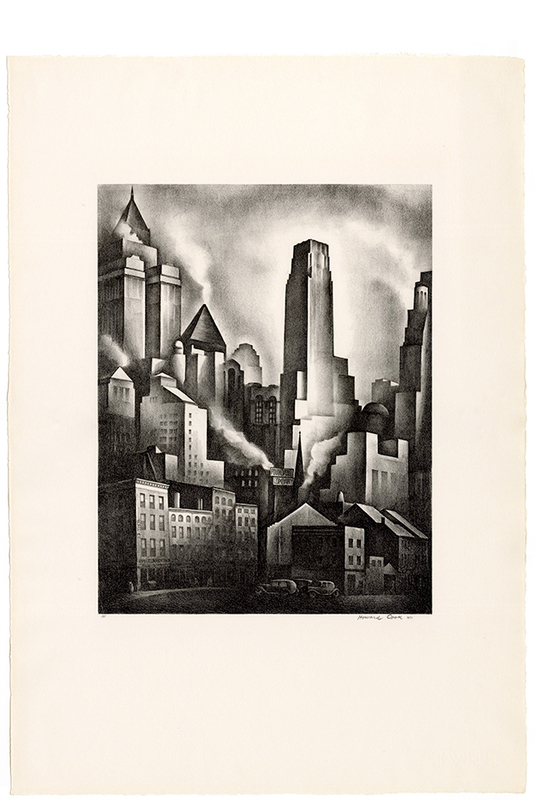 At the time Cook created this work, before the completion of the building's now famous art deco crown, the structure was the world's tallest building, holding the title for 11 months before it was surpassed by the Empire State Building in 1931. The Chrysler Building still ranks as the tallest brick building in the world (though the internal skeleton is steel), and remains New York City's most famous Art Deco landmark. Collections: Cornell University Library, Baltimore Museum of Art, Boston Public Library, Cleveland Museum of Art, Herbert F. Johnson Museum of Art, Cornell; Hood Museum of Art, Metropolitan Museum of Art, Museum of Fine Arts Boston, New Mexico Museum of Art, Museum of Modern Art, Smithsonian American Art Museum, New York Public Library. 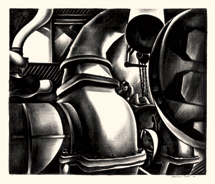 Engine Room - 1930, Lithograph. Duffy 128. Edition 75, only 35 printed. Signed, dated, and editioned 75 in pencil. Image size 10 1/8 x 12 1/4 inches (257 x 311 mm); sheet size 13 1/2 x 15 5/8 inches (318 x 397 mm). A fine, rich impression, on cream wove paper, with wide margins (1 to 2 1/2 inches), in excellent condition. 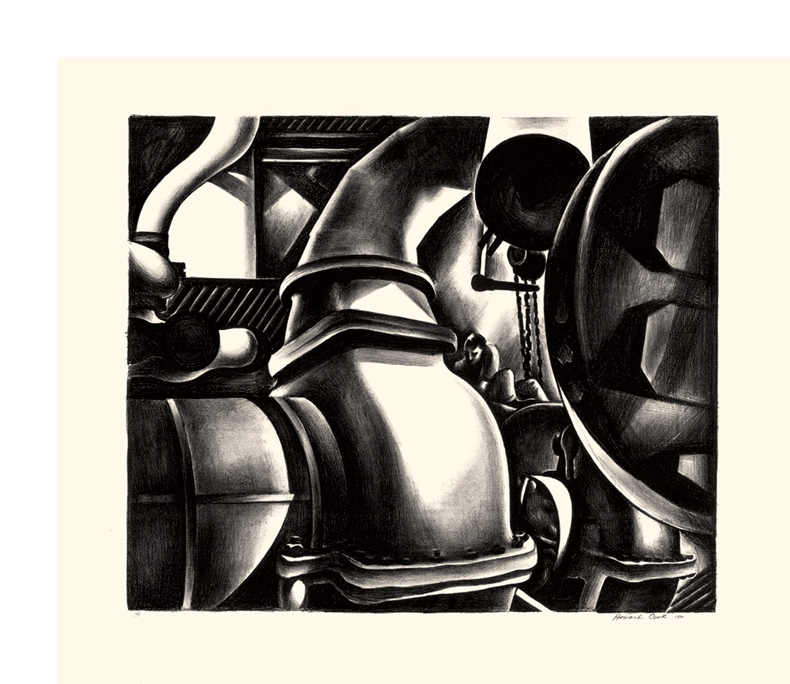 This work depicts the engine room of the S.S. Exhibitor, a freighter on which the Cooks sailed to Africa and Europe in 1929. Collections: Cornell University Library, Crystal Bridges Museum of American Art, Metropolitan Museum of Art, Smithsonian American Art Museum, Philadelphia Museum of Art. 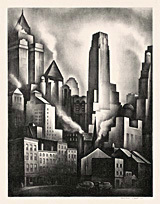 Financial District - 1931, Lithograph. Duffy 155. Edition 75. Signed, dated and numbered 75 in pencil. Image size 13 5/16 x 10 3/8 inches (338 x 264 mm); sheet size 18 3/8 x 13 3/4 inches (464 x 349 mm). A fine, rich impression, on cream wove paper, with full margins (1 1/2 to 2 3/8 inches), in excellent condition. 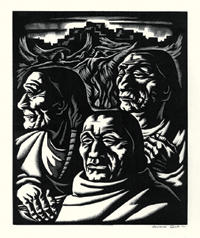 Illustrated in American Master Prints from the Betty and Douglas Duffy Collection, the Trust for Museum Exhibitions, Washington, D.C., 1987. Collections: Crystal Bridges Museum of American Art, Library of Congress, Metropolitan Museum of Art, Philadelphia Museum of Art, Smithsonian American Art Museum. Duffy 128. Edition 50, only 25 printed. Signed, dated, and annotated imp and 50 in pencil. Image size 4 7/8 x 9 7/8 inches (124 x 251 mm); sheet size 7 1/2 x 13 1/2 inches (191 x 343 mm). A fine, rich impression, on cream laid paper, with full margins (1 1/4 to 1 7/8 inch), in excellent condition. Printed by the artist. Scarce. Collections: NMAA, Philadelphia Museum of Art, Smithsonian American Art Museum, UNM. Duffy 165. Edition 25. Signed, dated, and annotated imp in pencil. Image size 8 15/16 x 11 13/16 inches (227 x 300 mm); sheet size 113/8 x 15 1/4 inches (289 x 387 mm). Scarce. A superb, atmospheric impression, in warm black ink on cream wove paper, with full margins (1 1/4 to 1 3/4 inches, deckle all around), in excellent condition. Printed by the artist. Scarce. 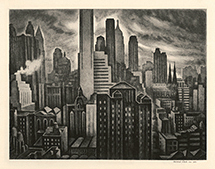 The artist uses three different intaglio techniques in this work to capture the gritty energy of New York City's monumental skyline. The view is looking south from midtown, with the Empire State Building in the center background and the Crysler building on the left. Collections: Georgetown University Library, National Museum of American Art, University of New Mexico. 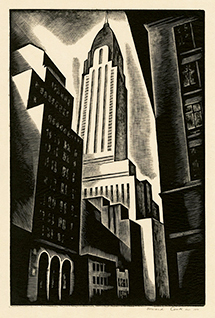 Looking Up Broadway- 1937, Lithograph. Duffy 192. Edition not stated. Signed and dated in the stone, lower left. Image size13 x 9 7/16 inches (330 x 240 mm); sheet size 19 3/16 x 12 5/8 inches (487 x 321 mm). A fine, rich impression, with wide to full margins (1 3/8 to 3 inches), on heavy cream wove paper. Pale tape stains on the sheet center verso (not showing recto), otherwise in excellent condition. 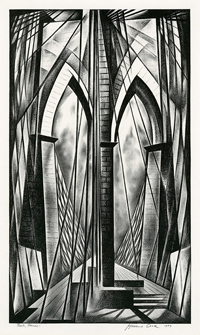 Published by the American Artists Group, New York, in an unsigned, unnumbered edition. Typically the AAG editions were c. 200 but the scarcity of this work suggests that the published edition was smaller, or that few impressions have survived. 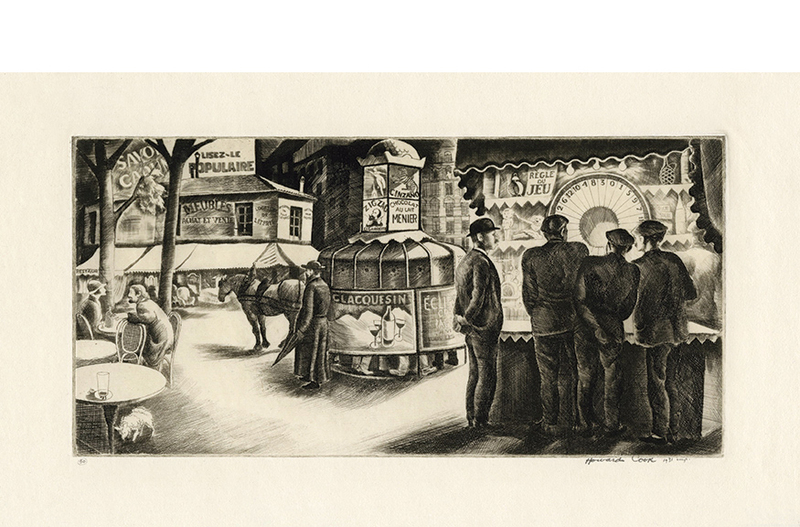 Collections: Achenbach Foundation for Graphic Arts, M. H. de Young Memorial Museum, San Francisco, CA; Metropolitan Museum, New York; Philadelphia Museum of Art. Eagle Dance - -1942, Wood Engraving. Duffy 201. Edition 200. Signed and dated in pencil. Image size 10 x 8 inches (254 x 203 mm); sheet size 14 7/8 x 12 1/4 inches (378 x 311 mm). A superb, black impression, on off-white wove paper, with full margins (2 to 3 7/8 inches), in excellent condition. 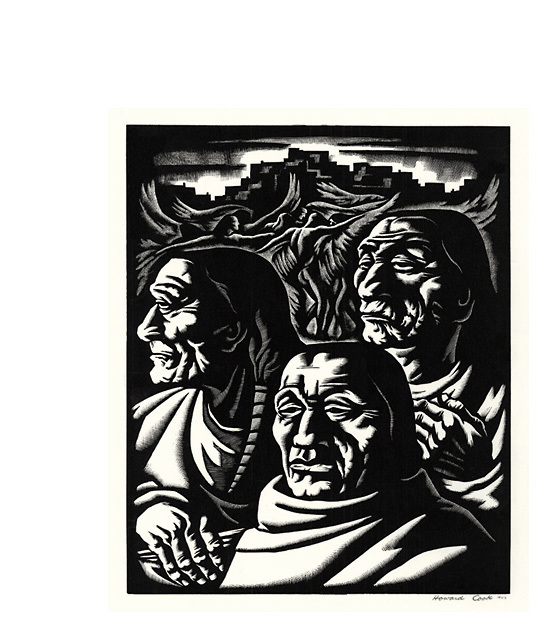 An impression from the edition published for the Twenty-first Presentation Print of the Woodcut Society, 1942. Printed by Torch Press, Cedar Rapids. Complete in the original Woodcut Society letterpress presentation folder. Collections: AHC, CMA, LC, MFA, NMAA, NYPL, ROS, SMFA, UNM, YALE. Duffy 214. Edition 20. Signed, dated and annotated Thanks, George! in pencil. Titled Brooklyn Bridge in pencil, bottom left margin. The annotation suggests that this impression was probably gifted by the artist to his printer, lithographer George C. Miller. A fine, richly-inked impression, on cream wove paper, with full margins (2 1/8 to 7/8 inches), in excellent condition. Scarce. 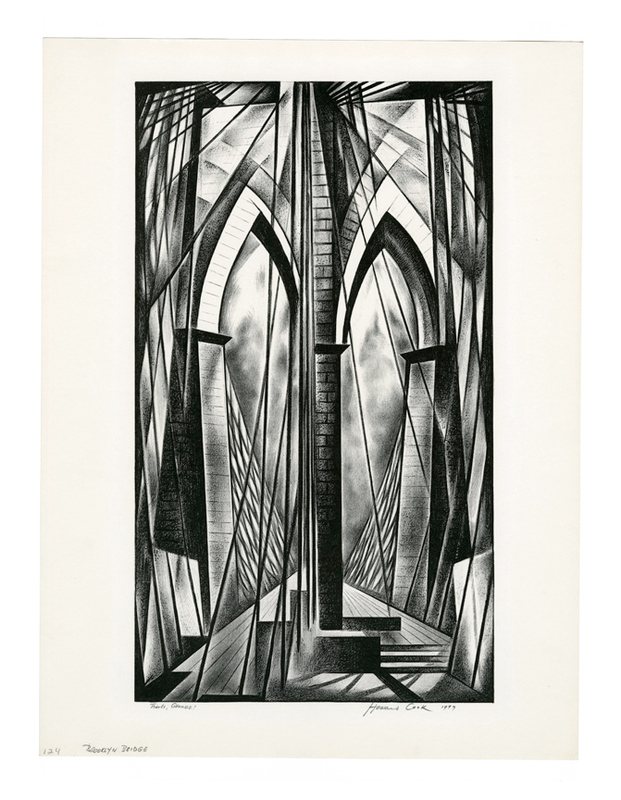 Featured with a full-page reproduction in the catalogue raisonnée of the artist's graphic oeuvre The Graphic Work of Howard Cook, Betty and Douglas Duffy, Bethesda Art Gallery, 1984. Collections: Boston Public Library, New Mexico Museum of Art, Philadelphia Museum of Art, Smithsonian American Art Museum.